For the House Redoran version, see Stronghold (Redoran). For the House Telvanni version, see Stronghold (Telvanni). Build your House stronghold, Rethan Manor, in three phases. Build the first phase of your stronghold. Talk to Dondos Driler at the Hlaalu Council Manor in Balmora to start the process. 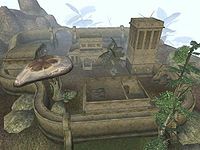 Travel to Ebonheart to receive the construction contract from Duke Vedam Dren. Travel to Vivec to buy the land deed from Baren Alen at the Hlaalu Treasury. Return to Dondos Driler with the deed and contract and the construction will begin. After a few days, talk to Driler again, who will ask you to check on the stronghold progress. Talk to foreman on the Odai Plateau, Durbul gro-Rush, and return to Dondos with the news. The first phase should be finished after a few more days. Build the second phase of your stronghold. Talk to Dondos Driler at the Hlaalu Council Manor in Balmora about the second phase. Cure the kwama queen at Shurdan-Raplay Egg Mine. 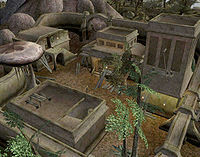 Recruit some miners from Gnisis and Tel Aruhn for the mine. Return to Dondos to start the construction. The second phase should be finished after a few days. Build the third and last phase of your stronghold. Talk to Dondos Driler at the Hlaalu Council Manor in Balmora about the third phase. Recruit a guard from Balmora Fighters Guild or the Imperial Legion at Moonmoth Legion Fort. Meet with the guard at Rethan Manor and deal with the bandits at Zainsipilu. The third phase should be finished after a few days. Once you reach the rank of Kinsman in House Hlaalu, any councilor or quest giver will tell you who to contact to start the construction of your very own stronghold (though you can actually start the process anytime after the rank of Lawman and Crassius Curio has seen you). Talk to Dondos Driler at the Hlaalu Council Manor in Balmora. He says you'll need to get a construction contract and a land deed in order to start the building. Travel to see Duke Vedam Dren in the Grand Council Chambers in Ebonheart to receive the contract (he'll only ask for a vow to help his people). You can buy the land deed from Baren Alen at the Hlaalu Treasury in Vivec (its base price is 5000 gold and is bought like a regular item, so a high mercantile skill and disposition could lower this significantly). Return to Dondos Driler with the deed and contract and the construction will begin. In a few days, you'll be prompted by an entry in your journal to talk with Driler. He'll provide the directions to your stronghold (the Odai Plateau, south of Balmora, past the Shulk Egg Mine, on the ridge) and ask you to check on its progress. The foreman on site, Durbul gro-Rush, will tell you that work should be finished within the week. Return to Dondos with the news. After a few days, another journal entry will appear to inform you that the first phase of the stronghold has been finished. Once the first phase of your stronghold is completed, you can return to Dondos in Balmora. He will tell you that you need to improve business near your stronghold by restoring the nearby Shurdan-Raplay Egg Mine, just across the river. You can restore the mine by curing the blighted Kwama Queen and hiring some miners. To cure the queen, simply cast a Cure Blight spell or scroll on her. Dondos says you can purchase scrolls from Hetman Abelmawia in his hut in Gnisis or Pierlette Rostorard in Sadrith Mora, but you may not have any luck with the latter. You could also get the Vivec's Touch spell from the Vivec Ashmask in the Gnisis temple. Once you've cured the Queen and hired one of the miners, return to Dondos to start the second phase of the stronghold. You should receive another journal entry one week later, when the second phase of construction is complete. Once the second phase of your stronghold is finished, and you've reached the Hlaalu rank of House Father, you can begin the third and final phase of construction. Speak with Dondos again, and he will tell you that you need to get rid of the bandits in the area of your stronghold. To do that, he says you'll need to hire a guard (regardless of your character's prowess), and suggests you seek one at the Balmora Fighters Guild or the Imperial Legion at Moonmoth Legion Fort. Moonmoth Fort will have no one to spare, but speaking with Flaenia Amiulusus at the Balmora Guild of Fighters will get you a guard named Fjorgeir for 1000 gold. It is only necessary to hire the guard to tell you where the bandit hideout is. If you have already found the hideout on your own, you can simply go straight there and eliminate their leader (or the whole lot), without having to hire the expensive guard. However, you may find him useful, as he will remain a companion, while he lives, whom you can take to other fights (or just station him at your stronghold when you don't need him). If you hire Fjorgeir, travel to your stronghold to meet him and talk to him about the bandits. The bandits are hiding out in the cave of Zainsipilu which is southeast of the stronghold. Follow the Odai River south until you come to a wooden bridge, with a nearby sign pointing west to Hla Oad and east to Seyda Neen. Follow the path east toward Seyda Neen, which winds its way between bubbling mud pools. After a short distance, you will find the cave north of the path. Travel there (with or without the guard) and kill the leader of the bandits, Maros Gimayn. Killing the other seven bandits is optional. Return to Driler to begin the third phase of construction. You should receive another Journal entry in three days when the last phase of construction is complete. Congratulations, your very own Manor overlooking the Odai is now ready. After the first phase of construction, if you skip directly to the task of recruiting miners, and choose to recruit Ilasour Tansumiran in Gnisis, you will then be able to go back to Dondos and initiate the construction's second phase without ever having actually cured the Kwama Queen. It is possible to pickpocket the land deed from Baren Alen. 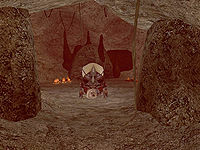 If you accidentally kill the Kwama Queen of your own Shurdan-Raplay Egg Mine (or killed her intentionally before knowing this was to be your future mine), Dondos Driler will tell you that your mine is finished, your stronghold construction will not proceed further, and neither will your own advancement in House Hlaalu. This game-breaking problem can be resolved by setting the Journal status of this quest to 170 or (if that doesn't work) to 200. If you have killed one of the two potential miners, the other may become unavailable. Should this happen, set quest status 150 to get around that problem. If you happen upon the bandits that are the target of the stage-three quest and kill them before getting the quest to hire a mercenary, Fjorgeir will not be available to you (asking Flaenia Amiulusus about him under this circumstance triggers her to say that he's dead). Workaround: Set quest stage 210, then 220. Do PlaceAtPC,Fjorgeir,1,100,0 in the console. Turn away and do PlaceAtPC,"Maros Gimayn",1,100,0. Quickly turn back to Fjorgeir and ask him to fight with you. After you kill Gimayn (again), Fjorgeir will continue to be a follower (or a stationary guard, as you like). He will not agree to either if there isn't a living Gimayn when you ask the first time. 5 In order to advance further, I must strengthen House Hlaalu by building a stronghold. 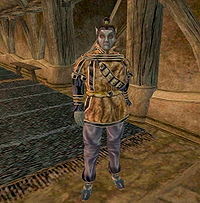 I should go to the House Hlaalu Council Hall in Balmora and speak with the stronghold builder, Dondos Driler. 10 I spoke with the stronghold builder for House Hlaalu, Dondos Driler. He told me that he would build a stronghold for me on the site of the old Rethan Manor. Before construction can begin, I must get a land deed and construction contract from Baren Alen at the Hlaalu Vaults in Vivec. 50 Dondos Driler accepted the land deed and construction contract. He said that construction would begin soon. I should speak with Dondos Driler again in a few days to check on the progress of my stronghold. 55 I should speak with Dondos Driler about the progress on my stronghold. 60 Dondos Driler asked me to speak with Durbul gro-Rush, the foreman at the construction site. My stronghold will be built on the ruins of Rethan Manor which is on the northwest bank of the Odai river which flows from Balmora to the coast. 70 Durbul gro-Rush assured me that the stronghold would be complete in one week's time. 90 Dondos Driler thanked me for keeping him informed of the progress on my stronghold. 100 Finishes quest The first stage of my stronghold should be complete by today. 105 %Name told me that in order to advance further in House Hlaalu, I must build improvements for my stronghold. I should speak with Dondos Driler again at the Hlaalu Council Manor in Balmora. 110 To improve my stronghold, Dondos Driler told me that I must improve business around my stronghold. The Shurdan-Raplay egg mine is just southeast of my stronghold, across the Odai river. Dondos Driler told me I should cure the blighted kwama queen and hire some egg miners. 120 Dondos Driler told me that I might could get scrolls of cure blight from Hetman Abelmawia in Gnisis or from Pierlette Rostorard in Sadrith Mora. 130 Dondos Driler told me that there are some unemployed miners in Gnisis and Tel Aruhn. If I can, I should draw experience [sic] miners away from House Redoran or House Telvanni. 140 I cured the blighted kwama queen in the Shurdan-Raplay Egg Mine. 150 I found a miner who will work for me in the Shurdan-Raplay egg mine. 170 Dondos Driler gave the orders to being [sic] improving my stronghold. 200 Finishes quest The next phase of my stronghold should be complete. 210 Dondos Driler told me that I need to recruit a guard for my stronghold from the Fighters Guild here in Balmora or Fort Moonmoth nearby. I also need to find and kill the bandits that are disrupting trade near my stronghold. 220 I have hired the mercenary Fjorgeir from the Fighters Guild here in Balmora. He will meet me at my stronghold. 250 Fjorgeir told me the bandits are led by Maros Gimayn and come from Zainsipilu, a small cave across the River Odai and over the hills to the south. He offered to either guard my stronghold or fight together against the bandits. 270 Dondos Driler gave the orders to put the finishing touches on my stronghold. 300 Finishes quest The final stage of my stronghold should be complete. This page was last modified on 19 October 2017, at 09:58.